Beautiful Views amoung the Aspen, Ponderosa Pines, Scrub Oak, and Juniper trees. 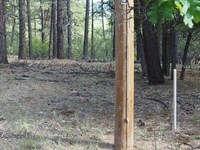 This property has Electric to the Lot line and a private Well. Several elevations to build on, and a lot of peaceful privacy to enjoy. This is a fantastic lot with Utilities.